Dr Mike Farquhar is a consultant in sleep medicine at Evelina London Children’s Hospital. He trained in general paediatrics, respiratory paediatrics and sleep medicine in Glasgow, Nottingham, Sydney and London, and took up his current post in 2012. The Evelina London Children’s Sleep Department provides a comprehensive diagnostic, assessment and management service across the whole of paediatric sleep medicine. Our clinic supports children, young people and their families with complex, rare and refractory sleep difficulties within London, but also across the UK. In addition to one of the busiest diagnostic paediatric sleep labs in the UK, Evelina London has the UK’s largest paediatric narcolepsy clinic. Mike has an interest in the importance of sleep, sleep deprivation and fatigue in the context of shiftwork within the NHS. He has worked to improve awareness and understanding of these issues since becoming a consultant, working with organisations including the London School of Paediatrics, the Royal College of Paediatrics and Child Health, the Association of Anaesthetists of Great Britain and Ireland (and received The AAGBI Award for this work in 2018), the Royal College of Anaesthetists, the British Medical Association and the Care Quality Commission amongst others. Routine teaching on this topic is now included in both Evelina London and London School of Paediatrics induction programmes. 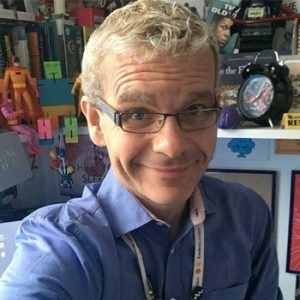 Mike can be found on Twitter @DrMikeFarquhar, where he regularly tweets about sleep-related issues affecting children and young people, as well as the importance of acknowledging the impact of workplace fatigue, and more general sleep issues. Mike also has an interest in raising awareness of challenges and issues faced by LGBT+ children, young people and families. He runs the @RainbowNHSBadge Twitter account. Outside of work, Mike can often be found in a theatre or reading X-Men comics … losing himself in stories has been a lifelong love.